a) He Who has the Universe as His body. b) He Who has a beautiful Form that finds entry into the mind, eyes, etc., of His devotees. c) He Who has mAyA Sakti in the form of the Universe. d) He Who has a Form that can induce mAyA in everything. "You are the karma-s; You are the worlds in which they are performed; You are the Soul of all beings;." . SrI Samkara vyAkhyAnam is "viSvam mUrtih asya sarvAtmakatvAt iti viSva-mUrtih" - He Who has the whole universe as His body or form, since He is soul of all. SrI rAdhAkRshNa SAstri identifies viSva mUrti with "viSva rUpam" that bhagavAn revealed in duryodhana's palace and other instances. He also gives references to the Sruti - "viSvAtmAnam parAyaNam" ( tait. AraN. 10.13), "Urdhvaretam virUpAksham viSvarUpAya vai namo namah" (tiat. AraN. 10.14). The dharma cakram writer comments that in order to appreciate the significance of this viSva rUpam of bhagavAn, first one should develop the mental maturity required for that. In the case of arjuna, he asked Lord kRshNa to show him the viSva rUpam, but when bhagavAn showed the viSva rUpam to him, he was completely bewildered and confused. This nAma signifies to us the need for developing our mind so that we can comprehend the viSva rUpam aspect of bhagavAn. b) SrI kRshNa datta bhAradvAj uses the meaning of the root viS - to enter, and gives the interpretation - viSati mano nayanAni satAm iti viSvA; tADRSI kamanIyA mUrtih yasya iti viSva-mUrtih - He Who has such an attractive Form that It finds entry into the minds, eyes, etc., of the good people. c) d) In addition to the meaning "rUpam" or "Form" for the word mUrtih, SrI satyadevo vAsishTha gives the additional meaning "mAyArUpA mohikA Saktih" for "mUrti" from the root murcchA - moha samuchrAyayoh - to faint, to become senseless, to grow, to prevail, to be a match for. Thus he gives the following interpretations to the nAma viSva-mUrtih - "viSvameva mUrtih AkAro yasya sah viSva-mUrtih", viSvameva mAyA = vimohikA Sakti yasya sa viSva mUrtih"; "vISvasya mohikA Saktih yasya sa viSva-mUrtih", which can be approximately translated as: "He Who has the Form of the Universe", "He Who is the mAyA Sakti in the form of the Universe", or "He Who can bind the Universe with mAyA". Even though every single thing in this universe is but a clear and vivid expression of bhagavAn's Sakti, most of us do not recognize any of that, and we look at our own form and conclude and feel proud that we are in sole control of that. All this is the result of bhagavAn's mAyA or leelA. The common dictionaries do not give this later meaning for the term "mUrti" (namely, mAyArUpA mohikA Saktih), but Prof. A. A. Ramanathan has included this interpretation in his collection of amara koSa vyAkhyAna-s - mUrchyata iti mUrtih. e) SrI baladeva vidyA bhUshaN links his interpretation for the nAma "viSva mUrtih" to the previous nAma a-parAjitah. His anubhavam is that bhagavAn is a-parAjitah or Unconquerable because He resides in and controls all the bodies of all the deva-s, gandharva-s, mAnava-s etc. - deva gandharva mAnavAdi sarva SarIrah. a) He of Immense form. b) He Who is immensely worthy of worship. "There (in that form) arjuna beheld the whole Universe, with its manifolddivisions gathered together in one single spot within the body of (Lord kRshNa)the God of gods". SrI v.v. rAmAnujan gives reference to tiruma'ngai AzhvAr's peria tirumozhi,where AzhvAr describes perumAL's mahA mUrti form - aLattarkku ariyAi - beyondmeasure. If this whole Universe is but a tiny part of His body, one canonly try to imagine His true mahA mUrti form. b) SrI kRshNa datta bhArdvAj interprets the word mahA as "pUjanIya",or worthy worship, instead of "big" in size. His interpretationis - mahatI pUjanIyA mUrtih AkRtih yasya iti mahA-mUrtih. The dharma cakram writer comments that the mahA mUrti form of bhagavAnillustrates a few points: a) It illustrates unity in diversity. Eventhough each embodied soul has its body, all are ultimately dependent on Him, andare part of His body. b) BhagavAn's body includes sRshTi (creation),sthiti (existence), as well as samhAram (destruction). In order forone life to live, another life is destroyed. In order to realize Him,sAdhanA is required, and for this a body is required. All these functionsare happening in Him because these are essential for the jIva-s to ultimatelyevolve towards Him and realize Him. The embodied souls do not realize Himbecause of the screen they have created between Him and them through theirkarma-s. When they refine their minds through several births and diverttheir minds towards Him, He will bless them with His anugraham, and they willsee His mahA mUrti form and beyond. He with a shining form. "Whatever being is possessed of power, or of splendor, or of energy, knowthat as coming from a fragment of My power". SrirAdhAkRshNa SAstri gives reference to kaThopanishad - tameva bhAntam anubhAtisarvam (2.2.15) - While shining by Itself, It also illuminates everything else. SrI v.v. rAmAnujan gives references to divya prabandham in support: nandAda kozhum SuDarE! e'ngaL nambI (peria tirumozhi 1.10.9); oLi maNi vaNNan (tiruvAimozhi3.4.7) - describing His dIpta mUrti character or guNa. SrI Samkara's vyAkhyAnam is that He is called dIpta-mUrtih because He is theincarnation of Wisdom (dIptA j~nAna mayI mUrtih yasya iti dIpta-mUrtih), orbecause He assumes the radiant form at His own will (svecchayA gRhItA tejasImUrtih asya iti vA dIpta-mUrtih). SrI cinmayAnanda gives reference to gItA11.12, where sa'njaya describes the splendor of Lord kRshNa to dhRtarAshTra -divi sUrya-sahasrasya bhavedyugapadutthitA - If a thousand Suns were to blazesimultaneously in the sky, the splendor of this is only a fraction of thesplendor of that Mighty Being. SrI satyadevo vAsishTha uses the term dIpta not only in the sense ofresplendence, but also in the sense of "explicit", and not hidden. Thus he comments that unlike thehumans who sometimes tend to hide what they do from others, bhagavAn does nothave a need to hide anything from anyone. He gives the example of a womanwho is to deliver a baby, the signs of which are explicit right up to the timeof the baby's delivery. The dharma cakram writer distinguishes between two types enlightenment: theenlightenment of the objects externally through the sunlight, and theenlightenment of the mind through knowledge. BhagavAn enlightenseverything externally in the form of the Sun, and He enlightens us internallythrough our minds. The bad acts in the external world invariably takeplace when the Sun is out, and when it is dark. It is the external lightof the Sun that keeps crime away. Similarly, the internal light is neededfor keeping the mind clean, and keeping negative thoughts away. ThegAyatrI mantra is one way that bhagavAn has provided for inducing andenlightening the mind. The significance of this nAma is to realize thatbhagavAn controls everything in this world both externally and internally bybeing the antaryAmi of everything, and cultivating our mind to seek Him whoenlightens our minds. a) He Who has even the subtle and formless things as His possessions. b) He Who Forms that are not the result of karma. c) He Who has a disposition that is not hard, inflexible, etc. d) He Who has Forms that are indescribable, and not fixed. e) He Who takes whatever Forms He pleases as His incarnations, and thus One Who has no fixed forms. "Earth, water, fire, air, ether, manas, buddhi, and ego-sense - thus My PrakRti is divided eightfold". yasya avyaktam SarIram - He Whose body the Unmanifested prakRti is- subAlopanishad 7.
yasya AtmA SarIram - He Whose body the individual soul is - Satapata brAh. 14.6.30). The pANini sutra 5.2.94 says that the affix matup comes after a word in first case in the sense of "whose it is" - tat asya asti asmin iti matup. Thus, SrI BhaTTar points out that the interpretation should be "One Who has as His possession the a-mUrti objects", and not as "He Who does not have a specific murti or form". The latter interpretation will take away the significance and purpose of the specific use of the matup affix in this case. Thus, according to SrI BhaTTar, the nAma a-mUrtimAn should not be taken to signify the negation of a form for BhagavAn. In addition to the matup violation, such an interpretation will be contrary to the earlier and later nAma-s, such as viSva mUrtih, mahA mUrtih, dIpta mUrtih, aneka mUrtih, etc. - tollai nan nUlil Sonna uruvum aruvum nee (tiruvAi. 7.8.10) - You are the Only One with a beautiful, enjoyable Form, and you are the also the One who is the abstract, invisible, soul of all things in the world! - OnRalA uruvAi aruvAya nin mAya'ngaL (tiruvAi. 5.10.6)- (I wonder) at Your wonders - You who has innumerable Forms, as well as One who is the (Formless) soul of all beings. SrI rAdhAkRshNa SAstri gives support from the Upanishads expressing that bhagavAn has as His Form the unmanifested objects as well as the manifested ones: divyo hyamUrtah (muNDako. 2.2); dve vA va brahmaNo rUpe mUrtam ca a-mUrtam ca (bRhadA. 3.1). b) SrI Samkara interprets the nAma as signifying that He has no form brought on by karma - karma nibandhanA mUrtih asya na vidyata iti a-mUrtimAn. c) As an extension of the meaning "that which has a form, shape, etc. ", the term mUrti also stands for "One who is hard, stubborn, etc.) - mUrtih kAThinyam" - amara koSa. SrI kRshNa datta bhAradvAj uses this meaning for the word mUrti, and gives the interpretation that because bhagavAn has a disposition that is not hard, inflexible etc., (krUra, kaThora), He has the nAma a-mUrtimAn. d) SrI satyadevo vAsishTha gives the interpretation that because bhagavAn has forms which are indescribable, He is not of a fixedform and therefore, He is called a-mUrtimAn. SrI cinmayAnanda gives a similar explanation - The limited alone has a form, but He being Unlimited, like "Space", has no limited form. e) The dharma cakram writer comments that bhagavAn takes the forms that He desires when He takes His incarnations, but He is not constrained in any way by that form. This is like the lotus leaf that remains in water but is not wetted by the water, or the fish that lives in mud but is not soiled by the mud. He takes His forms just for the protection of the good and the destruction of the bad. 726.aneka-mUrtih – He of manyforms. He Who can assume many different forms as He desires at will is aneka-mUrtih. “Inorder to be always in the company of His 16,100 Queens, Lord SrI kRshNa, the Sonof devaki, took as many forms”. manifold forms of divine effulgence, etc. 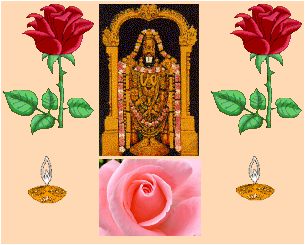 “ekam sad viprA bahudhA vadantyagnim yamam mAtariSvAnam Ahuh (Rg.1.164.46). SrI Samkarainterprets the nAma as a reference to bhagavAn taking different incarnations forthe protection of the world. He Who is not manifest; He Who cannot be easily realized. vyaktam means "manifest". vyaktam is anything that can beperceived through the sense-organs. Since bhagavAn is beyond the senseorgans, He is a-vyaktah. "Veiled by My mAyA, I am not manifest to all. The deluded world doesnot recognize Me as the unborn and immutable." "Not by the veda-s, nor by austerities, nor by gifts, nor by sacrifice, canI be seen in such a form as you have see Me" (kRshNa-s words to arjuna). which conveys the idea that even thou bhagavAn is closeby and never far away, Heis not seen, and He neither ages nor decays - such is His wonder. eko devah sarva bhUteshu gUDhah (Sve. 6.11) - He is One Deity, but Heremains hidden in all beings. SrI v.v. rAmAnujan gives support from the prabandham: "yavarkkumcindaikkum gocaram allan" (tiruvAi. 1.9.6) - He is beyond the grasp ofanyone through mere logical analysis; "yArurmOr nilaimaiyan ena aRivaRiyaemperumAn" (tiruvAi. 1.3.4) - (Except for His devotees) His true Nature isbeyond comprehension. Even when He reveals Himself at times momentarily,He immediately withdraws that memory from them, and becomes a-vyaktan again. He revealed His viSva rUpam to arjuna, but after this incident passed, arjunatreated kaNNan as His charioteer only. He revealed Himself to yaSodA, andfollowing this incident, she continued to tie Him up and beat Him for Hismischief anyway. SrI Samkara gives the interpretation that even though he has various forms inHis incarnations, He is called a-vyaktah because He cannot be defined preciselyin His true state in terms such as "He is of this nature, He is like thisetc." - yadyapi aneka mUrtitvam asya (previous nAma), tathApi ayam IdRSaeva iti na vyajyata iti a-vyaktah. He with a hundred forms. "As kRshNa enters the stage set by kamsa with His brother balarAma, theboxers saw in Him a thunder arriving, the menfolk saw Him as the best of men,the womenfolk saw in Him manmatha arriving, the gopa-s saw their friendarriving, the kings affiliated with kamsa saw Him as the enemy arriving to metout punishment to them, devaki and vasudeva saw their child arriving, kamsa feltthat death was approaching him in kRshNa's form, the ignorant saw a king coming,the yogi-s realized that the para tattvam was in front of them, and the yAdava-sfelt that some divine force has arrived to redeem their prestige". SrI SAstri also gives the analogy of the kalpaka vRksham - the tree that cangive anything that anyone wishes while standing under that tree. For example, all the different fruits and flowers that normally appear indifferent seasons will all be found at the same time in the kalpaka vRksahm, andwhoever wishes whichever species of fruits or flowers will just see what he/shewishes in the tree at any given time. BhagavAn is exactly that - He willappear in whatever form anyone wishes to see Him - Sata-mUrtih. SrI Samkara distinguishes between the nAma-s aneka-mUrtih and Sata-mUrtih asfollows: He interprets aneka-mUrtih in terms of His differentincarnations, and for Sata-mUrtih, he explains that even though vishNu is of theform of pure consciousness, He projects Himself as of many different forms byHis own thoughts - nAnAvikalpajA mUrtayah samvida-kRteh santi iti Sata-mUrtih. a) He Who is many-faced. b) He Who has provided many different means (such as nose, mouth, etc.) for lifeto be sustained. c) He Who has created various life-forms and provided easy means for theirsurvival. d) He Who is viewed in different "faces" (in different ways) bydifferent faiths. SrI satyadevo VasishTha gives the derivation of Ananam from the root ana - prANane - to breathe. According to pANini sUtra 3.3.117 -karaNa adhikaraNayoSca - the affixlyuT (ana) comes after a root, when the relation of the word to be formed to the verb is that of aninstrument or location. Thedefinition that SrI vAsishTha gives is A = samantAt anyate = prANyate anena iti Anananm = mukham - The part ofthe body which contains the meansfor breathing, namely the face. The word Sata has the same meaning as in the previous nAma, namely, many, uncountable, etc. Thus the explanation for the nAma is: SatamAnanAni yasya sa SatAnanah =anantAnanah - He Who has innumerable faces. "Everywhere are Its hands and feet; Its eyes, heads, and mouths are everywhere; Its ears are on all sides; and It exists encompassingall things." tOLgaL AyirattAi! muDigaL AyirattAi! tuNai malark kaNgaL AyirattAi! where nammAzhvAr refers to Him as "Oh Lord with a thousand shoulders,faces, eyes, feet, names", etc. SrI rAdhAkRshNa SAstri gives reference to the SvetASvtara Upanishad wherein Brahman is described as "sarvAnana SirogrIvah sarva bhUta guhASayah" - (3.11) - "He Who has many faces, heads and necks,and resides in the hearts of allthe beings". b) SrI satyadevo vAsishThagives a second interpretation, in which he takes Ananam to mean "the means for sustaining life", and givesthe meaning to the nAma as "HeWho has provided innumerable ways (such as nose, mouth, face, etc. ), through which life is sustained for the different creatures" - jIvana upAyAnAm ca bAhuvidyam, tathA cayadyad jIvane Silpa vaiSishTyam tattat tasyaiva bhagavata ityAkhyAtum SatAnananAmnA bhagavAn vishNuh stUyate. c) Yet another interpretationprovided by SrI vAsishTha is based on the pANinisUtra 3.1.26 - hetumati ca - which states that the affix Nic is employed after a root when the operation of a causer is to be expressed. Thus, he interprets the term "Ananah" as"Anayati iti Ananah" - "One Who causes, or makes it possible to live". Ananam is here interpreted as referring to bhagavAn's action increating the different life-formswhich have different ways of sustaining life. Ananah is thus given the meaning "jIvan dAtA - thelife-giver". The meaninggiven here is thus "He Who has created various life-forms" - catur-vidha SrshTi udvhAvinah anantAn jIvAn tat-tat jIvanaih upakaraNaih Anayati = jIvayatiiti SatAnanah. d) SrI rAdhAkRshNa SAstriexplains the nAma in terms of bhagavAn being seen in different "faces" by the different faiths such as thejaina matam, the bauddha matam,etc., and also viewed differently by nyAya, mImAmsA, etc., the dvaiti-s, adviati-s, etc.